A winding street in old Cremona, one of Northern Italy’s many municipal treasures, takes its visitors back 500 years to the golden days when artistic history was being made. The city, which gave birth to the greatest violin makers of all time, was a dynamic hub of activity back in 1500 thanks to the recent arrival of an influx of skilled Jewish craftsmen from Spain and Portugal, refugees fleeing the persecution of the Inquisition. In the long evolution of what became known as arte liutaria craftsmen mastered many skills to achieve the ultimate goal of creating an instrument. From choosing the ideal piece of wood to executing elaborate inlay-purfling work, instrument maker spent long years developing skills and discovering secrets of the trade. The violin as we know it took form over a long period of time. The names of the oldest violin makers back in the earliest days of instrumental craftsmanship are for the most part unknown; some were undoubtedly lute makers. Long before instrument making developed into a profession of note, troubadours sang their way across the European continent and built their own instruments. Centuries passed before the transition was made from wooden instruments equipped with a round single opening depicted in 12th century paintings to the Renaissance viol, the predecessor of the modern violin with its two “ƒ”-shaped sound holes. Following a series of combinations of two primitive types of early violins, three other families of instruments appeared before 1500: the viola da gamba (viol held on or between the player’s knees), the lira da braccio (played with a bow) and the viola da braccio (held against the shoulder). Andrea Amati is credited with designing the first modern viola da braccio, the true predecessor of the modern violin. It is difficult to define an exact time period when the violin came unto its own as a separate but equal member of the viola da braccio family. Terminology also took years to evolve. In Cremona Anno 1538, the “violino” was mentioned followed by the first English citation in 1572. Experts agree that the real precursor of the ‘modern’ violin emerged in its definitive form between 1520 and 1550 in Northern Italy. Two signed and dated violins by Andrea Amati built between 1542 and 1546, have survived the centuries altered to modern standards from their original three-stringed form. Few contemporaries of Andrea Amati would ever have believed that his instruments and those fashioned by his sons, grandsons and famed pupil Antonio Stradivari would count amongst the greatest treasures of all times. When asked to consider why old instruments are so prized, the late great New York based, French violin dealer Jacques Francais replied,“the secret is in the varnish.“ Around the middle of the 18th century, the secret of how to make varnish, that fine lacquer that gives old Italian instruments their incredible warmth and power, was lost. For the vast majority of violin makers since that time, the search for special varnish recipes is something of an obsession. Sometime in the early years of the 16th century, a Sephardic Jewish lute and rebec maker who fled the Spanish Inquisition registered in the city of Cremona under the Italianate name, Giovanni Leonardo da Martinengo. Martinengo had two Amatis working in his shop during the census year, 1526: Giovanni Antonio Amati and his brother Andrea Amati, the father of the modern violin. Documents point to direct evidence that Martinengo passed special secrets concerning the preparation of varnish to the two brothers. Martinengo had learned from his travels to instrument-making centers in Spain and North Africa to expose wood to sunlight for at least one year before varnishing in order to eliminate extra moisture remaining in the wood. He also learned to apply a “preparazione” of natural substances to harden the dry wood and how to apply the layers of precious varnish to the completed instruments. For centuries, Amati family instruments have been admired and sought out not only for their sound but also for their extraordinary amber-colored varnish. When Andrea Amati made violins in the 16th century he made violins as matched sets, or consorts of instruments. The most famous of these is a set of instruments he made during the 1560′s and 1570′s for the court of Charles IX in France. His mother, Catherine de Medici, loved to dance and imported the instruments and musicians from her Italian homeland for the “ballets” and other dances at the French court. The violin as a consort instrument was used through out Europe during the 16th and early 17th centuries for dance music and polyphonic compositions. Andrea (Cremona, Italy, 1505-15?? date disputed by historians) has come down through history as the father of the violin. Andrea and his brother Giovanni were hailed as the leading viol and rebec makers in Cremona at the turn of the 16th century. Few examples of Andrea’s work have survived the centuries. Experts agree that instruments dated in the latter part of the 16th century were made by Andrea’s sons, Antonius and Giralmo. Continuing the family legacy, Antonio Amati (1555-1640) and Giralmo Amati (1556-1630) established the famous Cremonese violin-making school. The brothers worked on many commissions as a team as well as making their own instruments. Perhaps the greatest pedagogue in the Amati family, Giralmo’s son, Nicolo (1596-1684) was credited with teaching an extraordinary class of students including Andrea Guarneri, Francesco Ruggieri, Paolo Grancino and the most illustrious violin maker of all times, Antonio Stradivari. Of all the extraordinary craftsmen in the Amati family, Nicolo was the most eminent. His instruments stand out for their meticulous, refined workmanship. The trademark Amati varnish is golden-yellow with a slight red coloration, his models are refined reflecting his choice for the finest grained wood. As a rule, Nicolo Amati used a small pattern for his violins. The few larger scale instruments still extant, known as ‘grand Amatis’ are highly valued. During his lifetime, Nicolo completed an astonishing number of commissions for violins, violas, cellos, three- string bass viols and the long-lost instrument, the pochette. For history buffs and instrument collectors alike, it is paramount to note that the Latin forms of the first names, Andreas, Antonius, Hieronymus, and Nicolaus, were generally used in the Amati violin labels, and the family name was sometimes latinized as Amatus. Needless to say, Antonio Stradivari has been falsely represented in countless instrument labels through the ages as Antonius Stradivarius. The French King Charles IX (1550-1574) went down in history as a weak king who loved the luxuries of royal life. Charles ascended to the throne at age ten, his forceful mother, Catherine de Medici, held the reins of power. Encouraged by fanatic Jesuit advisors, Charles IX attraction to the Huguenot movement soon changed to blind hate. Charles instigated the infamous St. Bartholomew massacre which claimed over 100.000 Protestants within one bloody week. For string instrument aficionados, Charles IX occupies a very different place in history. In place of the horrific murderer, Charles was the benevolent patron of the arts responsible for commissioning Andrea Amati to create a unique group of instruments shortly after the first half of XVI century. Charles placed this substantial order for thirty-eight instruments designed by the “great master Andrea Amati” to encourage court musicians and composers to “perform with the greatest joy” at the King’s treasured palace of Versailles. Soon after the arrival of 24 violins, 6 violas and 8 cellos, the art of violin making expanded rapidly throughout France with Amati’s designs as the guiding light. The great Carlo IX of France (1566) violin on permanent exhibit at the Municipal Museum in Cremona bears testimony to the fact that the art of the Cremonese master had reached far beyond Italian borders. One of Europe’s premier chamber ensembles, the Amati Ensemble is the brainchild of the Israeli violin virtuoso, Gil Sharon. 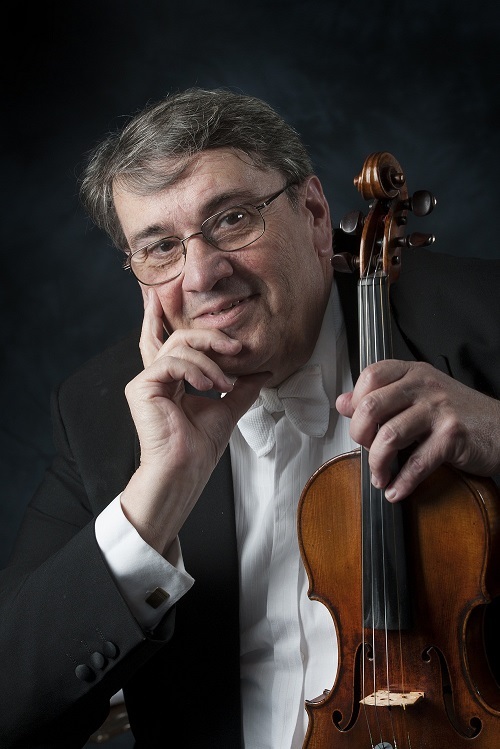 A greatly acclaimed soloist, concertmaster and chamber musician, Mr. Sharon garnered many international solo prizes and has performed with legendary musicians from Shlomo Mintz to the Borodin Quartet. As professional musicians the world over attest, Gil Sharon’s ability to excel as a chamber musician, orchestral leader and soloist of great merit put him in the coveted category of super-musicians at the very top of a competitive vocation. Founded by Gil Sharon in 1992, the Amati Ensemble is composed of a core group of internationally acclaimed artists and performs a vast repertoire of chamber music and string orchestra masterpieces. The group was careful to choose a name that represents its attributes and values, standards reflected by the impeccable craftsmanship so apparent in Amati family instruments. A commitment to the highest level of artistry and knowledge sharing with younger generations of musicians are the goals made tangible through Amati Ensemble performances, master classes and recordings. The Amati Ensemble initiated an innovative chamber music series in Maastricht in 1995, which soon became one of the cultural highpoints for one of the most culturally active regions in northern Europe. The group has released numerous cd’s and is currently involved in a series of international television broadcasts. Future plans for the active ensemble include a premier chamber music series, which will take place at one of the most important venues in Europe: the Concertgebouw in Amsterdam (Chamber Music Hall). A strong commitment to the future of classical music in a European context has led the Amati Ensemble to apply for a European cultural promotion grant to further the cause of cultural cooperation between its musical activities in The Netherlands and other major culture producing European countries: France, Finland, Germany and Poland and Spain. Exporting its firm belief in education for a new generation as an intrinsic part of live musical performance, the Amati Ensemble has established meaningful ties with one of the leading music festivals in Europe, the renowned Festival Pablo Casals in Prades, France. Gil Sharon and his exceptional colleagues look forward to participate in a wide variety of celebratory events and concerts that will take place in October 2005 as an integral part of the Amati 500th anniversary celebrations in Cremona, Italy. The Amati Ensemble has chosen to celebrate the extraordinary inventiveness of its namesake, Andrea Amati, founder of the Amati dynasty in a vital, cultural capital, Maastricht, The Netherlands. In the heartland of picturesque Limburg, the southern-most Dutch province much-beloved by international tourists for its rolling hills, congenial hospitality and superlative cuisine, Maastricht has gone down in world history as the important city where the Maastricht Treaty, the accord that transformed the European Economic Community into the European Union was signed in 1992. Further back in history, the Dutch Burgundian city synonymous with the fine things in life moved from outpost to metropolis of strategic importance after the Romans arrived in 50 B.C. A Catholic centre of learning and power, Maastricht attracted trade and industry becoming one of the most prosperous Northern European cities in the late Middle Ages. A boom in the leather and cloth trade created a flourishing bourgeoisie anxious to pay tribute to the Church. The churches brought with them sculptors, wood carvers, painters and craftsmen working in gold, silver and ivory. While Amati was experimenting with wood sorts and varnish, artistic experimentation was the name of the game in the Maasland area. Modern Limburg and its lovely capital Maastricht are justifiably proud of a rich history and plethora of cultural activities: a fine symphony orchestra (Limburg Symphony Orchestra), world-renowned annual Art and Antique Fair (TEFAF) and a well-respected repository of old masters and contemporary art, the Bonnefanten Museum are a few of Maastricht’s many cultural attractions. From music to craftsmanship to cultural heritage, the underlying idea behind AMATI IN CONCERT, 500 YEARS OF HERITAGE is as simple as it is beautiful: music for craft’s sake and the commemoration of Amati’s unique gift to humanity through a gala concert performed on the finest Amati instruments. Thanks to an extraordinary loan agreement with the Municipality of Cremona and the Palazzo Communale, three leading examples of Amati dynasty instruments: the priceless Andrea Amati ’Carlo IX’ violin, dated 1566; the Nicolo Amati ’Hammerle’ violin dated 1658 and a viola made by Antonio and Girolamo Amati, the ’Stauffer’ dated 1615, will be displayed during the internationally acclaimed European Fine Art Fair (TEFAF) from 4-13 March 2005 in Maastricht. From admiring these incredible works of art, to hearing Amati instruments in consort at the gala performance on 6 March 2005, the Amati Ensemble’s unique celebration of 500 years of craftsmanship bridges the world of the artisan with the performing musician’s world of sound in an unforgettable celebration of art at its best. The Amati Ensemble (founded in 1992) is the brainchild of the highly acclaimed Dutch violin virtuoso, Gil Sharon. A greatly acclaimed soloist, concertmaster and chamber musician, Gil Sharon garnered many international solo prizes and has performed with legendary musicians from Shlomo Mintz to the Borodin Quartet. As professional musicians the world over attest, Gil Sharon’s ability to excel as a chamber musician, orchestral leader and soloist of great merit put him in the coveted category of star-musicians at the very top of a competitive vocation. Since its inception in 1992, the Amati Ensemble has met with great succes throughout Europe. Many well-known soloists including Shlomo Mintz, Jeremy Menuhin, Nobuco Imai, Tabea Zimmerman, Boris Berman, Peter Frankl, Jaap van Zweden and Han de Vries have performed with the Amati Ensemble. In 1993 the ensemble released its debut CD featuring the works of Mozart and Spohr. Since then several more discs have been released, including the works of Clara Schumann, Händel, Mozart, Mendelssohn and Schubert. In August 1994, the Amati Ensemble met with great critical acclaim at the Old Krakow Festival in Poland. Since that time, invitations to perform in Canada, Greece, Israel, France, Germany and Spain have followed. In the last 5 years the Amati Ensemble toured Canada, Israel, France, Czech Republic and other European countries. The Amati Ensemble features in their own chamber music series in the city of Maastricht since the fall of 1995.